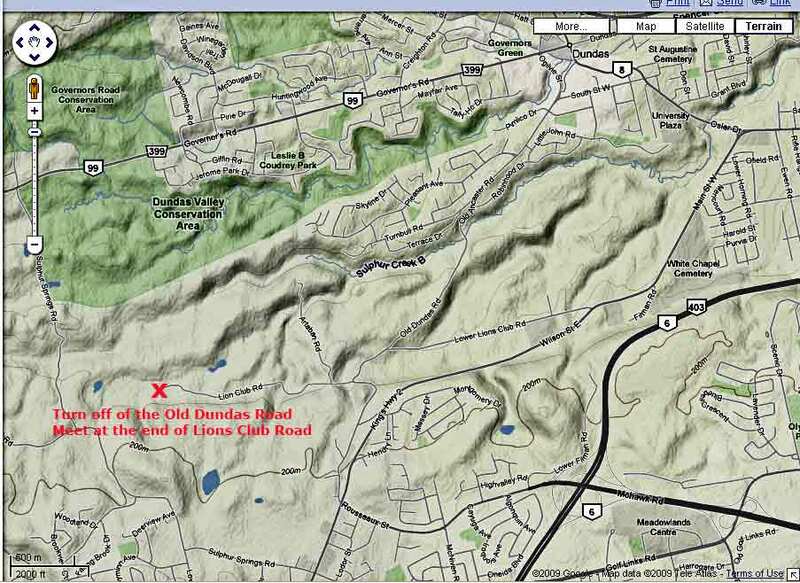 Lions Club Road is accessed from the Old Dundas Road. From Dundas turn south from Governors Road onto Ogilvie and then turn left onto the Old Ancaster Road. The Old Ancaster Road changes it's name to Old Dundas Road at some point that I have yet to figure out. Shortly after one passes Lower Lions Club Rd that comes in from the left there is a sharp curve in the road. At that point the gravel Lions Club Road goes right. Just follow it to the end for parking. From Hamilton, start up Highway 2, aka Main Street West, and turn right on Lower Lions Club Road just before the highway heads up the mountain. Turn left on Old Dundas Road and then right on Lions Club Rd. From Ancaster, start down the escarpment on Highway 2, aka Wilson Street. At the stoplight part way down, turn left on Montgomery and then, a couple of hundred metres along, turn right on Old Dundas Road. Lions Club Road goes straight at the bottom of the hill when the Old Dundas Road turns right.